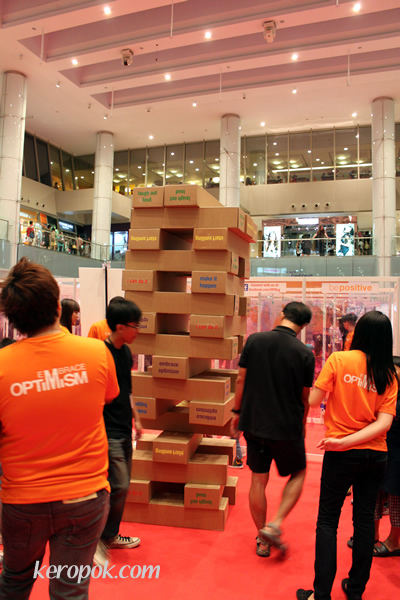 The Singapore Health Promotion Board had a "Be Positive" event recently. It was health in conjunction with World Mental Health Day which was on 10-10-10. I think it's a good day to choose 10-10-10. I took this photo at Marina Square. It is a big jenga like display with lots of positive words on it. Are you a positive person or are you always having negative thoughts? I know some people do break down. There was an ex-colleague working in another department which we think has gone 'mental'. She talks to us about things that happened a few years ago as if it just happened a few days ago. I think she went to the doctors and is under medication.